True Grit: Root’s Meatballs & Grits appetizer is just the start of what is good on the menu at this new restaurant. 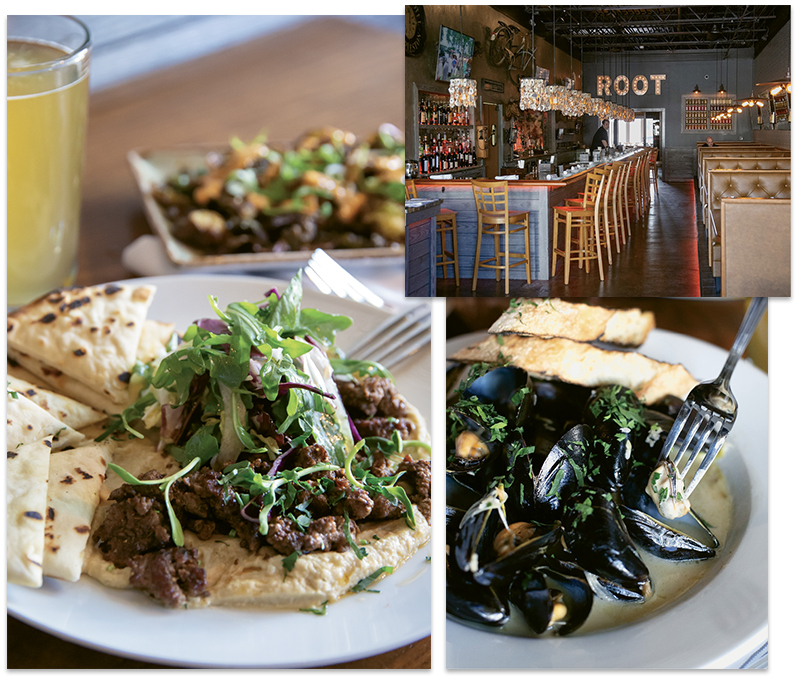 Just as the roots grounded in Mother Earth are the source of life, Root in downtown Georgetown is the source of a sort of culinary rebirth along Front Street. The new eatery, opened by the same restaurateurs responsible for successful predecessors Costa and Caffe Piccolo on the southern Grand Strand, is a swanky fusion of modern, rustic and coastal-cool. The environment evokes the same vibes that are the norm in one of the many Charleston foodie hotspots. Antique bicycles are mounted on cement-colored walls behind the bar, while, on the opposite side of the shotgun-style interior layout, old mirrors hang on vintage wallpaper that’s rolled above a long line of U-shaped booths. Hanging lamps cloaked in curtains of oyster shells dangle above a bar that nearly runs the length of the building. Additional seating at Root is available to the left of the front entrance and at the very back of the restaurant (overflow and private seating) overlooking the Sampit River. There’s also alfresco seating along Front Street, which will be lovely when the Southern evenings are warmer. Our party of four was seated in one of the brown leather booths, and we settled comfortably into a round of cocktails: a whiskey sour, Moscow mule, Harborwalk and a pint of Blue Moon. Fresh Start: The hummus appetizer, served with lamb and warm pita triangles, is one of the many internationally inspired cuisines Root explores. For starters, we ordered a new addition to this section of the menu, as reported by our smiling server: the hummus, served with lamb and warm pita triangles. And we were glad Root added the dish, as it was rich, creamy and creatively flavored (and disappeared from the platter quickly). We also tried the Crispy Brussels Sprouts starter—and it was so good we nearly ordered a second one! The often-underappreciated veggies were light, crisp, sautéed and tossed in ponzu sauce, sriracha sauce and toasted benne seeds. That ponzu zest nicely complemented the bite of the Brussels. The restaurant’s tagline is “American Cuisine, Local Roots,” and the menu certainly digs into foods in the United States, from coast to coast, while still being heavily rooted in Lowcountry signatures. Three-quarters of us decided to remain in the starters section for our dinner course. There were just so many tempting options! The Mussels Alla Root was divine, with a large bowl of mussels steamed in a tangy broth swimming with fresh herbs and crispy bacon crumbles that we wanted to just drink up, but the grilled bread slices sopped most of it up for us. And the Meatballs & Grits was a refreshing twist on this Southern comfort that’s usually topped with shrimp. Two large meatballs were tomato-braised over creamy Anson Mills polenta with burrata cheese, Pecorino and basil. Hearty and satisfying! 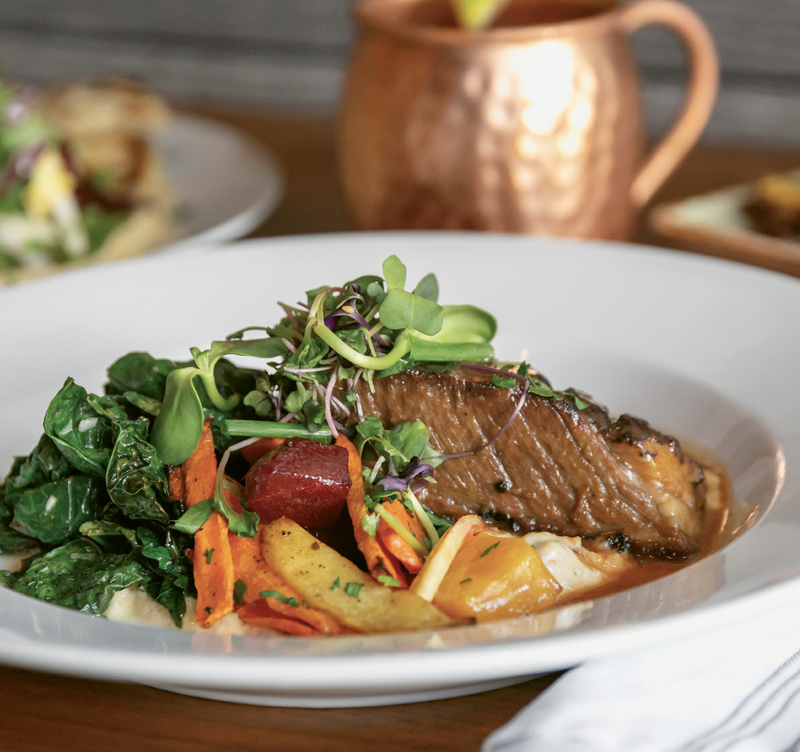 The one entree that was sampled was the award-winning Beef Short Ribs, which were red wine-braised and deliciously melt-in-your-mouth moist, served over grits, roasted root vegetables, gremolata, local greens and gravy. This dish was preceded by a fresh salad tossed in tangy vinaigrette. By Land & Sea: The intricate flavor details of both the mussels and beef short rib creations at Root are unparalleled. The Root menu reads like a bestselling novel I want to open again and again. On my next visit, I’d like to cozy up to a bowl of their butternut squash soup, which is stirred up with toasted homemade marshmallow. And I want to venture into the entrees section, particularly to the Grilled Local Striped Bass that’s served over a unique blend of cauliflower rice with tempura sweet potatoes, shaved collards and roasted shiitake mushrooms. Then there’s the Mushroom Ragu, which will be a must in the future: a brew of roasted wild mushrooms simmered in a black truffle marinara and tossed with pappardelle pasta and Romano cheese. That’s the thing about Root—there isn’t just one thing that stands out. There are many. From the front to the back of the house, the team pays detailed attention to every ingredient and flavor balance that’s plated, as well as to every nuance in the hip, soulful surrounds that appeals to all the senses. And that’s why Root is firmly planted in local culinary greatness.